Give Away: GNOWFGLINS™ Lacto Fermentation eCourse! EVERYONE should learn to ferment foods. "Why on earth", you ask? First, the health benefits are wonderful. Lacto fermented foods increase the beneficial organisms in your body while feeding you at the same time! conveying benefits to your gut, your immune system, and your digestion." Purchasing fermented foods at the grocery store isn't always a good choice because often they contain nitrates or they've been cooked until they're no longer a living food. And if you try to acquire the same benefits of fermented foods from supplements, it will cost you a lot more money and you have to trust that the manufacturer is being honest and using quality ingredients. Besides, I have my doubts that anything in a pill can deliver the same benefits as a living food God designed for you to consume. Second, fermentation is a wonderful way to preserve foods. Years ago, people fermented foods and kept them in root cellars or caves in order to keep the food fresh for long periods of time. If you've ever thought about going off-grid (or "off off-grid") or perhaps you intend to build a root cellar (maybe you already are blessed with one! ), then learning to ferment takes you one step closer to becoming independent from commercial producers and grocers. And that's a good thing! Fermentation is a natural process that everyone can do. We just have to learn what we've lost and recover those skills. And I can't think of an easier way than with a video eCourse. I can testify from personal experience, Wardeh's classes are the best. Even better than in person because you can replay the video over and over until you "get it", ask questions in the forum, and refer to your notes again and again, all while you're walking through the steps in your own kitchen. And the basic course is only $8/mo! Where are you going to find a deal like that? (Typically one lesson is released each week). I'm signed up. Who's going to join me? Wardeh is offering one Homestead Revival™ reader a free 6 month Basic Subscription to her GNOWFGLINS™ eCourse!! Friends, this is a wonderful opportunity allowing you to complete the entire Lacto Fermentation eCourse during that time period. All you must do is purchase your supplies and ingredients. 2. To enter a second time, blog, FB, or Tweet about this give-away and include a link back to this page. Be sure to leave a second comment telling me you've done so. This Give Away ends Saturday at 5:00 p.m. PST. It's always fun to announce the winner of a give-away! Last week, Tanya Williams, an Independent Consultant for Shelf Reliance, hosted a great give-away for THRIVE products. I'm pretty picky about food that I'm storing, but I admit, I was very impressed with this product line, so I hope you'll check it out if you missed it last week. Keep in mind that prices are discounted if you go through Tanya's page! Michelle from Out of the Box! Congratulations! 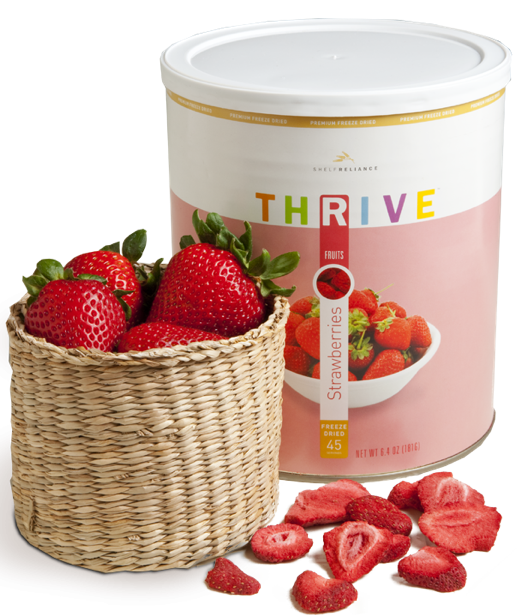 Please contact me, Michelle, so we can get your Thrive products on the way to your home! It's 12:00 A.M. and I've just pulled into town from my trip to Washington. As a result, not much has happened on my own homestead this week, but I did get to stop in Oregon at Territorial Seed Company! We arrived close to their closing time and so I had to shop quickly and didn't get to see their entire operation - only the store where they sell seeds and plants. But it was fun none-the-less. 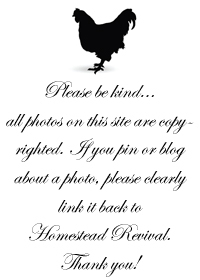 How about sharing about your own homestead happenings? 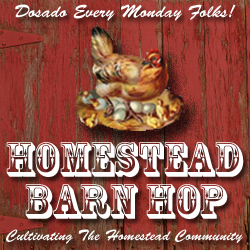 Your Turn To Join The Barn Hop! 3 You will be blessed in the city and blessed in the country. 4 The fruit of your womb will be blessed, and the crops of your land and the young of your livestock—the calves of your herds and the lambs of your flocks. 5 Your basket and your kneading trough will be blessed. 6 You will be blessed when you come in and blessed when you go out. 7 The LORD will grant that the enemies who rise up against you will be defeated before you. They will come at you from one direction but flee from you in seven. 8 The LORD will send a blessing on your barns and on everything you put your hand to. The LORD your God will bless you in the land he is giving you. 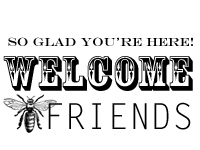 Welcome back to the Preparedness Challenge! Each week we gather here to share what we've done to prepare for life's unexpected events, whether it's putting up items in food storage, gathering emergency supplies, or learning skills for sustainable living. This week for the preparedness challenge, I filled our propane tank for our camp stove and worked on our garden's watering system, which probably doesn't qualify as "preparedness" but since we've been traveling away from home for almost the entire week, it's about all I could do! At least I did ONE thing and I now know where my two propane tanks are and that at least one is filled. I confess, I was a bit proud of myself for traveling prepared! Instead of eating out for the two days it took us to travel from CA to WA, we packed an ice chest and took an extra bag of food. This allowed us to eat some excellent meals with very little effort, saving us money and our health! Knowing we had food along the way was a blessing and I plan to do a little grocery shopping for the trip back. I'd love to find a farmer's market! Too bad I'm on the wrong side of Seattle or I'd go to Pike Place Market as I travel back through (we're soooo close). 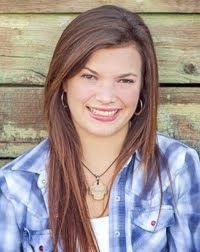 My consolation is that we WILL be traveling through Cottage Grove, OR and I get to stop at Territorial Seed Company! Yahoo!! To join the Preparedness Challenge, just write a post on something you did this week to prepare and then link up below or leave a comment. Be sure to take the Preparedness Challenge Picture and add it to your blog so others know you're participating. Hopefully we can spread the word and encourage others to join! Is Pasteurized Milk Safer Than Raw Milk? "I am afraid to buy something raw from people I do not know who do not have to adhere to standards. Is that a valid concern?" But that doesn't mean you shouldn't consume ANY raw milk products. Making the decision to switch to non-pasteurized milk just isn't that simple. And if you're considering such a change, you should be a responsible consumer, do some homework, and make an informed decision that you can live with comfortably. Obviously, as far as raw milk is concerned, it MUST be handled properly. If you can meet the farmer, take an educational tour of his barn, see his herd for noticeable evidence of good health, and perhaps watch him milk, then you can make a fairly well informed decision. All equipment should be kept in pristine condition, udders thoroughly washed before each milking, and the actual milk should be filtered for small particles such as hair. Finally, the milk should be chilled right away. 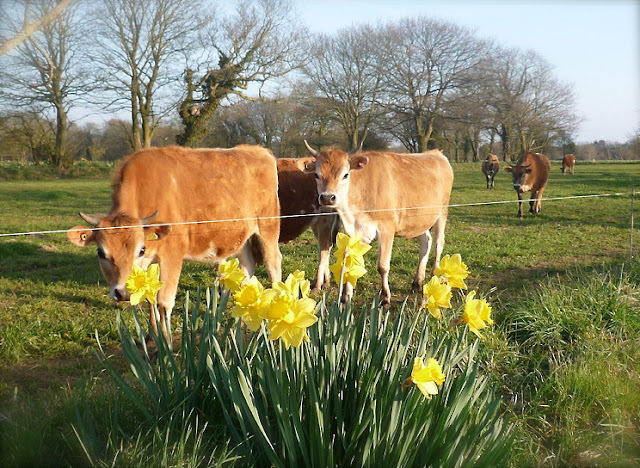 Seeing first hand how the farmer operates is not always possible, in which case you might need to do some quiet investigating among friends or acquaintances who use the dairy and find out what they know about their sanitations standards. 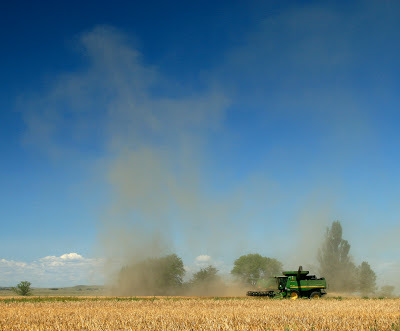 But be careful so as not to draw attention to the farmer. If you think the government's happy about all this raw milk love, think again. Even where it's legal, raw milk dairies are not looked upon favorably by the government or "establishment" and often there is suspicion and an eye toward finding fault with them in order to shut down their operation. There's also a few websites and blogs specifically set up to convince people NOT to consume raw milk, which include examples of individuals getting sick from raw milk products. But what they fail to mention is the fact that there's just as many or MORE cases of individuals getting sick from pasteurized products. Cooking a product to death does not make it healthier for you. Nor does it mean that once it is sterile, it will remain so. There is a huge misconception that "pasteurized" means it can't be contaminated. Since nothing "living" remains in the milk, there is none of the good bacteria to fight any of the bad bacteria that might start growing in the milk after pasteurization has occurred, which is why it's a must be handled carefully and refrigerated at all times. "In what microbiologists call the principal of Competitive Exclusion, non-pathogenic bacteria like, say, Lactococcus lactis, can actually limit or kill bad bugs like Listeria monocytogenes, responsible for hundreds of illnesses yearly (2)." 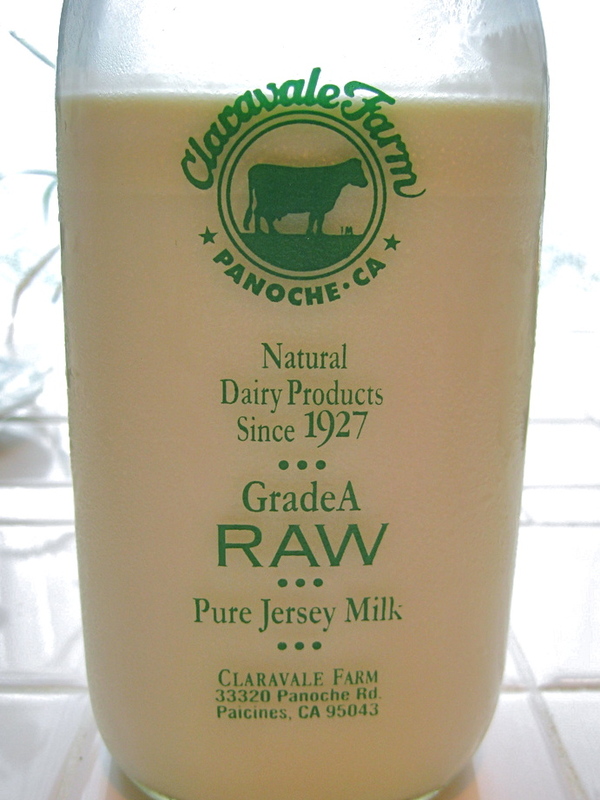 The natural lactic acid in raw milk actually helps keep the good and bad bacteria in balance! God planned it perfectly. So it's usually not the milk that is the issue (unless the animal is sick), but rather how it is handled afterward. But to our modern minds, we have difficulty thinking outside the "refrigerated" box on this one! Consider the fact that people consumed raw milk for thousands of years before refrigeration methods were common place or before Louise Pasteur ever taught them how to pasteurize it. Sure some got sick, but it wasn't until the 19th century that things got out of hand and it became a huge health issue. 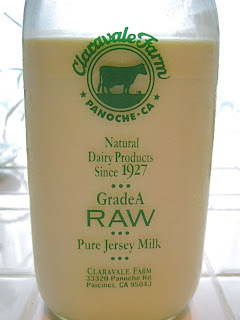 (See my post Raw Milk: An Introduction and Brief History). I'd be the first to agree that there was a problem with milk during the late 1800's and children in particular were dying from a bad product, but the solution wasn't necessarily the correct one. Instead of getting to the root of the problem, which was bad animal husbandry practices, the government opted to just kill all the bacteria in milk altogether. (Of course, they had to "fix" the milk by adding stuff back in as well, but we never will make a product as good as the one God originally designed). 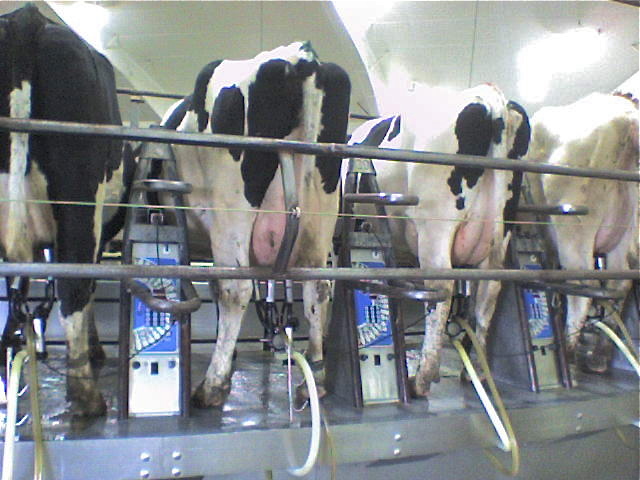 Since the government didn't require large milk producers to change their bad habits (which is what created the problem to begin with) many animals being milked for commercial purposes STILL continue to be kept in less than sanitary conditions (relatively speaking since we're dealing with animals). To make matters worse, they are fed a diet that is not natural to their God-ordained design, and must be given antibiotics to kill the bad bacteria in order to keep the milk safe. This is exactly why pasteurization is so appealing and necessary... it kills bad bacteria that enter the milk which is usually due to bad animal husbandry practices! Since small scale dairy farms have more control over their smaller herds, they tend to "know" their animals and monitor them for health issues more closely, while maintaining better living and milking conditions. Sure, farmers can do a bad job at this, just as easily as the large commercial dairies, but that's where knowing your farmer is a must. And if the dairy is a "certified" raw dairy, you can be sure it has been inspected a LOT more often than a conventional dairy! The standards are much higher, and the milk is much better. Am I making a clear case here... that pasteurization would not be necessary if the cows and milk were handled properly according to God's design? And so we come back around to the beginning again... you need to either know your farmer or milk your own. But raw milk in and of itself is a great food! So it becomes a question of who are you going to trust? The farmer who willingly shows you his operation and encourages questions to educate the public OR the nanny state that would like to keep you on the proverbial bottle telling you not to ask questions, but to just trust them because they are the only ones who are capable of making a "safe" product and wise enough to make such a decision? 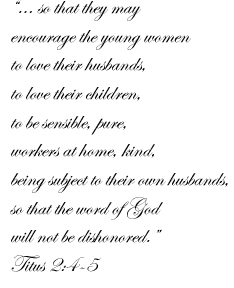 "Let no unwholesome word proceed from your mouth, but only such a word as is good for edification according to the need of the moment, so that it will give grace to those who hear." Mint is one of my favorite plants. It tastes wonderful and it's practically a no fail herb. Well, almost. But it has one major problem. It's VERY invasive. Before you know it, mint will take over an entire bed, creating a mass of roots that takes forever to pull out (and with much effort!). Dig a hole big enough for a large flower pot. Because of my cold climate, I recycled an old plastic clay colored pot because the actual clay pots will crack with the weather extremes. Next, sink the pot in the ground and fill it with potting soil or good quality soil and amendments. Mint grows well in a semi-shaded area. I'm adding this pot to my medicinal/kitchen herb garden just outside my kitchen. Plant your mint directly in the pot. This will allow your mint to grow where you want it in the flower bed, but without the roots spreading beyond the borders of the actual pot. Note that I kept the top of the pot well above ground level so that the runners won't "jump the fence". Soon this will fill in beautifully and should last for years while staying tame. To start more mint plants, just cut a stem of mint, place it in water for a few days and it will begin to send out small roots. When you have quite a few new roots, transfer it to potting soil and you have a new plant. (Sorry, I took a picture of this, but can't find it!). Mint tea... I can hardly wait! Give Away: Shelf Reliance & THRIVE! If I'm going to do some major food storage, I want to know that what I'm storing tastes good. And even better, it's healthy! Anytime the body is under stress, good nutrition is extremely important, but most easy to prepare foods require a lot of preservatives or packaging techniques that make them less than desirable. 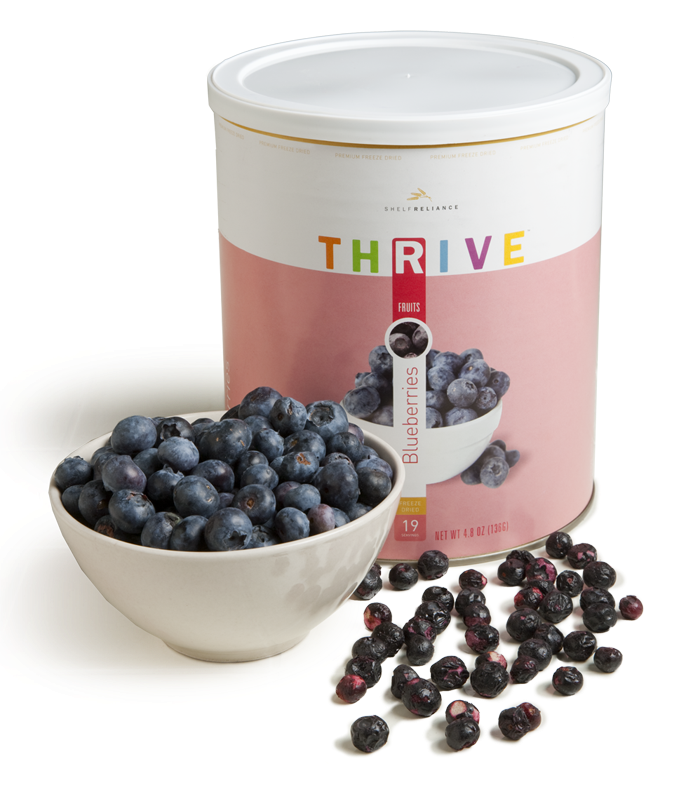 Packaged by Shelf Reliance, THRIVE products are flash frozen and then vacuumed sealed by removing 98 percent of the moisture using vaporizing ice and sealed in oxygen proof cans to ensure freshness. 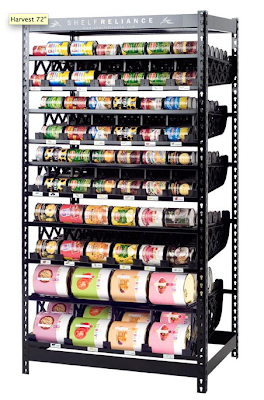 These three steps keep most foods shelf stable for 5, 10, and even 20 years depending on the product and 6 - 18 months once opened. 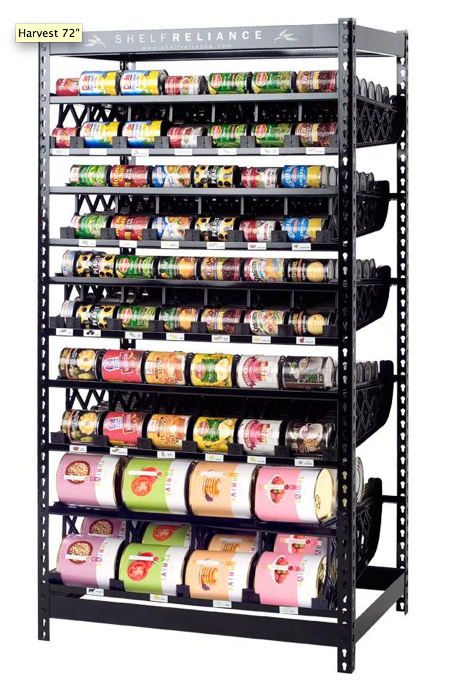 With over 100 products, one could prepare any number of meal combinations to add variety to the table. 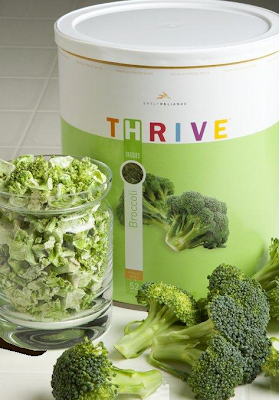 And if you need help, there's even a THRIVE cookbook coming out soon for using the products. Most products can be used directly out of the can, eliminating steps such as chopping vegetables or browning meat, which would be great if a real disaster occurred and the bulk of your time needed to be spent doing something other than preparing meals. I had a chance to sample some berries from my friend, Shelf Reliance Consultant, and Homestead Revival™ reader, Tanya Williams, and I was very impressed! I had no idea they could make something freeze dried taste so good! And because they taste good, when it's time to open up the can and use it in my daily food preparation, my family won't feel like they're eating cardboard! 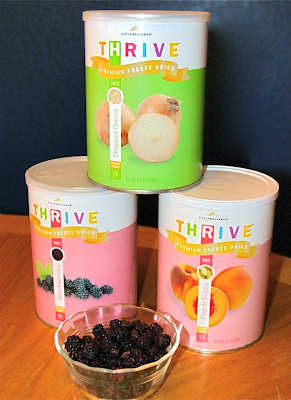 Tanya is kindly offering Homestead Revival™ Readers a chance to win a three pack she has put together including chopped onions, blackberries, and sliced peaches, so you can become familiar with the THRIVE products! 1. 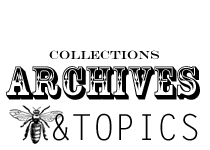 Visit Tanya's Shelf Reliance page and check out the many great products they offer. Come back and let Tanya and I know your favorite item and what you would use it for. Be sure to check out their Food Rotation Systems and Emergency Preparedness section as well! 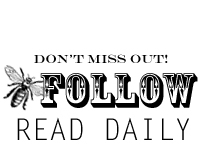 Please leave an email address if you do not have a blog! 2. Enter again by going to Tanya's Facebook page and "Like" her! You'll be able to keep up with great ideas, specials, and other news this way. Be sure to come back and let me know by adding another comment. 3. Blog, FB, or tweet about this give-away and leave a comment to enter a third time! 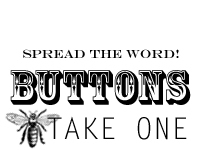 * Be sure that you you shop through Tanya's page because items are discounted there! If you go directly to the Shelf Reliance site without going through Tanya, you'll pay full price. 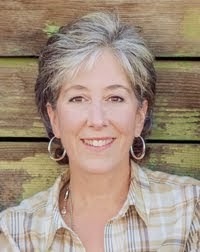 The give-away will end Saturday, June 25, 2011 at 5:00 p.m. PST. When you read a fellow blogger's post that is linked below, and you like it, be sure to comment and let them know you've been there (because we ALL like to get comments, right?) and then come here and "like" it, right underneath their thumbnail photo. You can "like" as many as you want. It's not a contest, but rather a way for you to share which posts are a good read. Be sure to try reading some that haven't had a "like" hit since there could be a great treasure and a new friend behind that thumbnail. 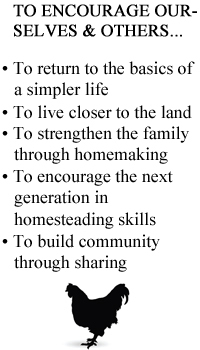 Meeting new homesteaders is part of how we are all community! Here at my own homestead, my husband has just finished cutting out the brackets that will go on the back of the garage for my new clothesline. 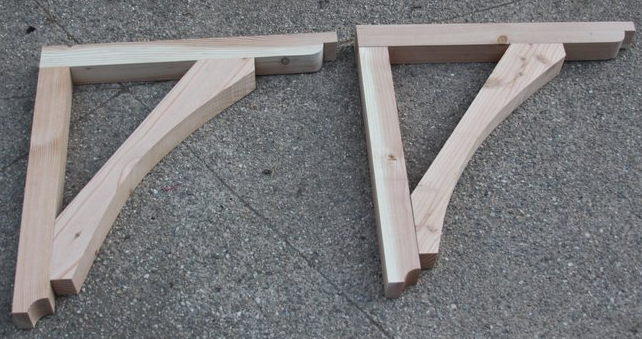 These will soon be painted white, attached to the wall, and then eyes added for a few lines. The Freedom Rangers are now out of the coop and actually free ranging in a tractor. Sometimes I just let them out to roam when I'm outside. Of the 25, I've lost 3, and 2 are just hanging on. Who knows? They may make it until time for butchering. 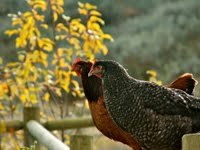 They can still access food, water, and grass, and they don't seem to be the brunt of pecking. The feed company is working with us on the issue, so I'm happy about that. The garden is looking better every day, but I don't have any pictures to share - sorry about that! I'm harvesting lettuce, potatoes are coming up, and tomatoes are in along with some other veggies. And that about sums it up for this week at my place. How about you? 1. 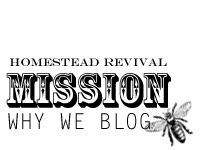 Write a blog post about what's going on at your homestead or a post on something you're learning or an item of interest that will benefit the homesteading community. 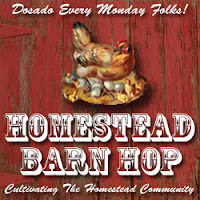 Be sure to add the red Barn Hop banner and link back here so others can join in the fun. "Consider it all joy, my brethren, when you encounter various trials, knowing that the testing of your faith produces endurance. And let endurance have its perfect result, so that you may be perfect and complete, lacking in nothing. But if any of you lacks wisdom, let him ask of God, who gives to all generously and without reproach, and it will be given to him. But he must ask in faith without any doubting, for the one who doubts is like the surf of the sea, driven and tossed by the wind." "Blessed is a man who perseveres under trial; for once he has been approved, he will receive the crown of life which the Lord has promised to those who love Him." Did you think about preparing this week? And were you able to do something related to either food storage, emergency preparedness, or perhaps sustainable living? Even one thing counts! I know I did a little bit better. Not anything big, but my mind was on it more and I actually accomplished a couple of things. First, I got quite a bit more of the garden planted. After I had my moment of despair (see my prior post "Gardening Like My Life Depended On It"), I managed to move forward and get something done out there! And can I add that all of your comments really encouraged me even further! There's something comforting knowing you're not the only one struggling at times. 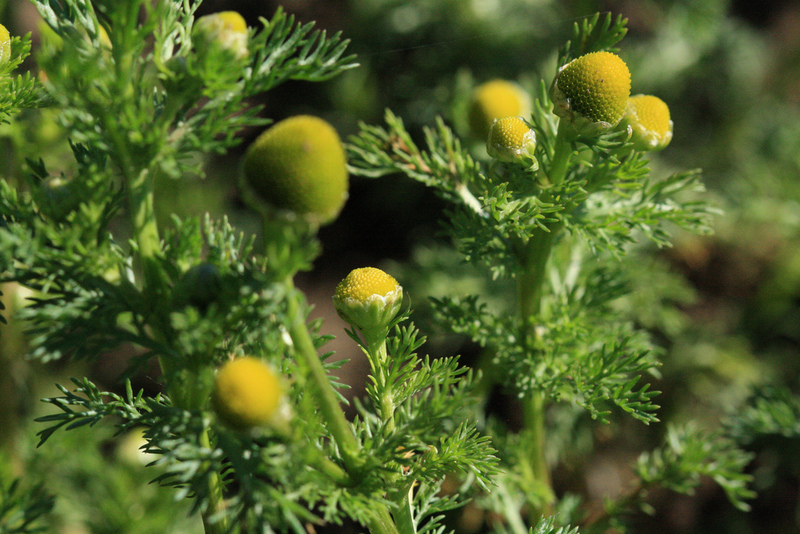 I also found wild chamomile in my yard, or rather, it found me. The stuff is everywhere, but I really didn't think much about it until my 9 year old started asking questions about it. She has been making all kinds of concoctions with it and we wanted to know if it was safe to really use, so I started looking into it. Apparently, wild chamomile is a cousin to German chamomile and has all the same medicinal characteristics. Only wild chamomile doesn't get the white petals. Second, I tried some emergency food bars that my friend, Tanya, sells. At 400 calories, it's a complete meal and easy to stick in a 72 hour bag. I'm planning on making a purchase in the next week or two so my GOODY bags ("Get out of Dodge y'all") are just about finished. Be sure to visit here Tuesday as Tanya will be hosting a great give-away! 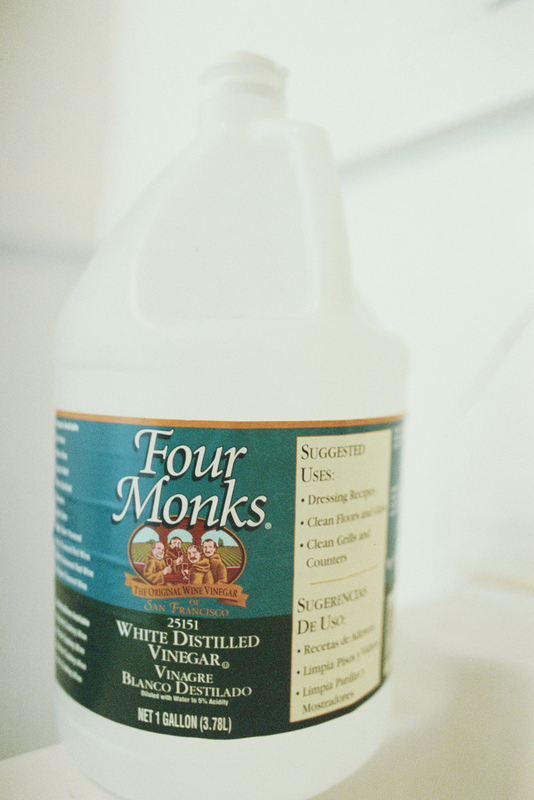 Finally, I added 3 Costco size containers of distilled white vinegar to my food storage. Vinegar is great for cleaning, disinfecting, and pickling (although not for lacto-fermented foods) as well as a host of other uses and I seem to be using more and more of it lately which prompted me to make a large purchase. I like storing items I know I'll really use! Wow! I think I hit all three preparedness categories. I've already started thinking about what I'm going to do for next week and I plan on starting right away! How are you doing? Guest Post: "Like A Bubbling Brook"
Can We Recover Lost Skills?